The French magazine specialised in architecture, L’Arca International, has organised a new competition in which participating architects had to design a hotel complex. 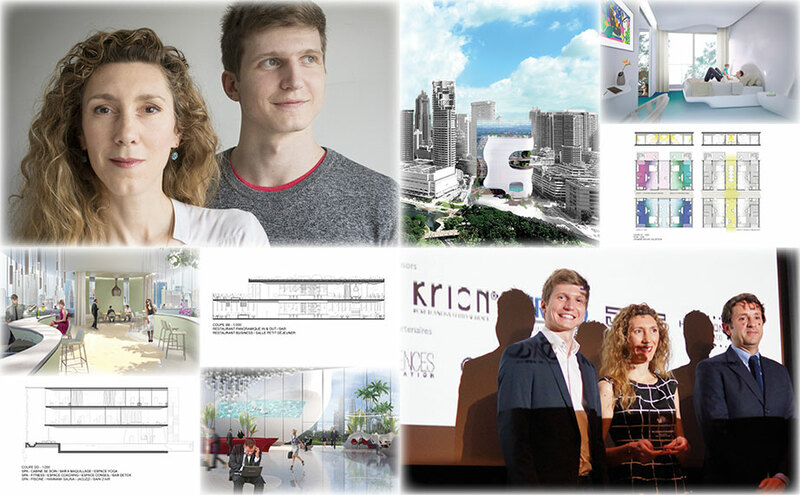 The award ceremony was held in Paris, France, and architects Bertrand Chapus and Melanie Lallemand Flucher were winners of the Prix Création & Innovation award. KRION® PORCELANOSA Solid Surface has played an active role in this edition as a Partner in the contest, and as a material chosen by many entrants for presenting their work. Award winners Bertrand & Melanie designed the spectacular L’Organic’Epure Hôtel*****, two separate buildings with a patio connecting them. We can find the solid surface fromPORCELANOSA Group, KRION®, in many of the rooms of the hotel, the facade, bars, bathrooms, furniture, and vertical coverings. It is present in a large number of spaces, giving this artistic explosion increased functionality within the spectacular project, creating a perfect symbiosis between the glass facade and KRION®. Congratulations to the winners!! !